Any self-respecting gentleman should be able to tie a tie but it’s a sad fact that these days more and more guys are resorting to clip on ties. Sure, it might be quicker and it might be easier, but there is something so much more impressive about taking the time and effort to wearing a tie you have to knot yourself. This especially goes for important business meetings, job interviews and er…court appearances. But there’s not just one way to tie a tie and depending on your shirt’s collar and the material of the tie, you should be tying different knots if you want to really give your appearance the edge. Here we take a look at three different knots – and how to create them. For all knots you should be standing in front of a mirror with your shirt buttoned up and your collar up. The Four in Hand Knot: this is generally the most common way of tying men’s ties – mainly because it’s the easiest! Use it when: your tie is made from heavier fabric and your shirt has a smaller spread collar. 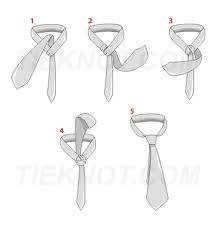 Make sure the wider end of the tie is hanging on the side of your body that you write with i.e. wide end on the right if you’re right handed and vice versa. Find the front seam on the narrow end of the tie and place the wide section over the narrow part ensuring they are crossing on the seam. To tighten, pull it up by sliding it up at the narrow section. Finally straighten it and you’re good to go! The Half Windsor Knot: this knot is a somewhat small symmetrical triangle. Use it when: you’re wearing a wide tie and a shirt that is made from a lightweight material with a standard collar. Ensure you have around 12” of the widest end of the tie hanging below the narrow end. Pass the wide section over the narrow end and bring it around and under the narrow part. 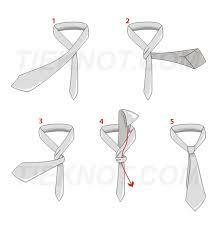 Bring up the wide end and pass it downwards through the loop between your shirt collar and the tie. Next pass the wider section across the narrow part of the tie so it is going from right to left. Pass the wide part upwards into and through the loop for the second time. The wide section should then be pulled downwards through the front of the knot. Finally pull the knot tighter and make sure it’s central within your collars so it doesn’t look crooked. The Windsor Knot: similar to the Half Windsor but with a larger triangle-shaped knot. Use it when: you’re in a formal setting and wearing a shirt that has a wide spread collar. Make sure the wide part of the tie hangs approximately 12” below the narrow section then pass the wide part over the narrow. Pull the wide end through the loop that’s between the tie and your collar and bring it down towards the front of the shirt. Pass the wide part under the narrow end and towards your right hand side. Next pull the wide section through the gap again. If done correctly, you’ll have a triangle where the knot sits. Take the wide end of the tie and wrap it around this triangle – you need to be pulling it from right to left. Pass the wide part upwards through the loop yet again and then through the front of the knot. 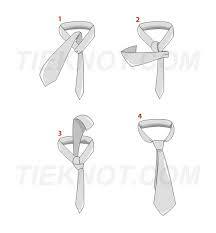 You’re nearly done – just adjust to make sure the knot is central and the tie is hanging correctly. So there you have it: three different ways of wearing a tie; next time you’re wearing a suit, instead of reaching for the clip-on, why not give it the heave-ho and be brave and attempt to get knotted instead. It might mean setting the alarm an hour earlier to practice but at least you’ll be looking dapper! Do you have any unique ways of knotting your ties that you’d like to share? Why not let us know in the comments box?